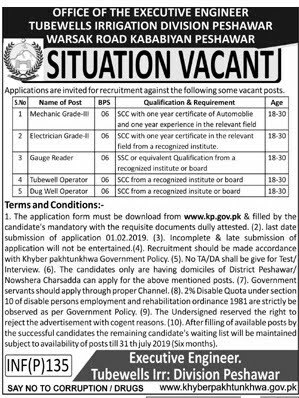 Below are the complete details of the Electrician jobs in Irrigation Department in Peshawar. 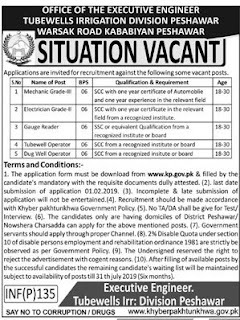 Qualification: Irrigation Division Peshawar Jobs For Electrician. Required Qualification: SCC with one Year Certificate in the Relevant Field. Age Limit: Minimum 18 Years or Maximum 30 Years. Attractive Salary Package. Last Date for Submission of application 1st February 2019. Electrician jobs in Irrigation Department Peshawar, in Pakistan published on Paperpk.com from newspaper on January 07,2019. Job seekers who are already working as electricity installation and repair , Electrical Supervisor,Electrical Technician ,Electrical Technician , Electrical Technician Electric work can also apply for post of Electrician.